My hair likes to wave. *No, this isn’t really my hair. It belongs to a little girl I met at the fair. ROFLMAO. Damn hair. Good one Q. Sadly I get more riot than wave with mine. Good one Quilly. quilly, your comment touched my heart. i so needed that reminder. thanks, girl. Brilliant take on the theme. Oh to have that hair! Long may she wave! Great haiku. My hair stands by the grave and waits. I agree with Robin, my hair definitely has more riot than waves! gosh I wish my hair looked like that! I have to straighten mine every day or the riot needs police action! Lovely little haiku Quilly! 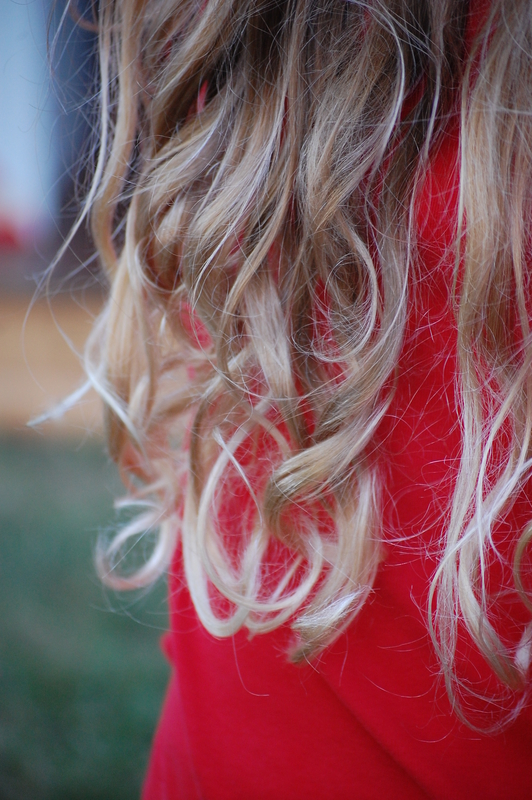 My mom used to say, “My hair is wavy — each strand waves at the next one.” As I did not inherit any waves I am envious! That little girl’s hair is gorgeous. Love it. There are so many ways to interpret one word. Great variation on the subject, and well-expressed. in any case, origina approach..
That’s a lucky little girl! Nice picture! Love the hair color, soft curls are cute. I used to pay lots of $$ for those waves! Then the grey took over and since my hair is long I had to pick between grey or curls, so dye won by a landslide! Riot… heehee! Story of my life, and in more ways that just hair. Good one, Q! Sweet poem though! My orange locks like to RIOT too – almost daily!